In April 2018, SAGE Publishing opened its e-book collection to Research4Life. Thanks to this addition, AGORA’s (Access to Global Online Research in Agriculture) collection now includes 3,325 new e-books! 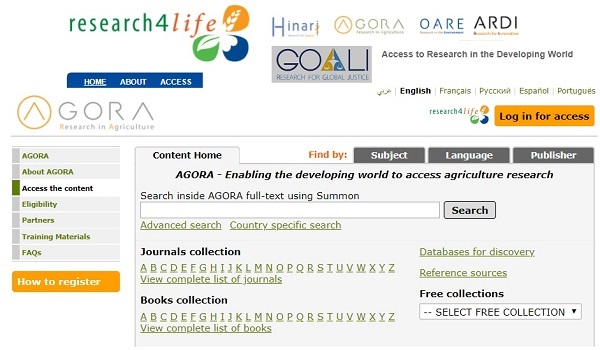 Founded in 2003, by FAO of the UN in partnership with Cornell University and 65 world leading science publisher partners, AGORA is one of five programmes in the Research4Life initiative that provides free or low cost access to major scientific journals in agriculture and related sciences to public institutions in developing countries. Research4Life also includes Hinari, OARE, ARDI, and GOALI (launched in 2018). AGORA offers its resources (over 10,459 active key journals and 26,536 e-books) to more than 3400 registered institutions in eligible countries (Group A and Group B). See: Research4Life registered institutions. If your institution is not registered and falls under one of these eligible countries, access can be granted by following the instructions provided in this registration form. Join Research4Life and benefit from thousands quality research resources that may be accessed by just logging into the joint launch page. Set up in 1965, SAGE is a leading international, independent, academic and professional publisher of innovative, high-quality content. Each year, SAGE publishes more than 1000 journals and over 800 new e-books each year, covering a wide range of subject areas. SAGE’s growing selection of library resources includes archives, data, case studies and videos. SAGE has published open access journals for a number of years with the goal of disseminating vital research to the broadest community. Central to SAGE’s mission since its inception is to focus on communities firmly believing that access to education creates healthy minds and cultures. SAGE also maintains an active relationship with various organisations to support both original research and training opportunities. In April 2018, SAGE Publishing made its e-book collection (composed of 3,325 items!) available to Research4Life. 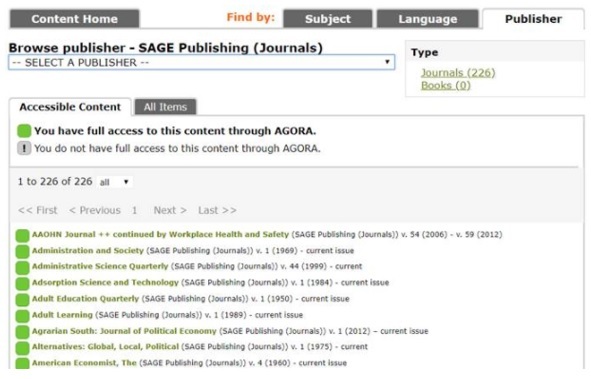 Even though SAGE does not publish agriculture e-books, it does contain some subject areas that are included in AGORA. All e-books are included by subject area rather than individual book title. Through Research4Life and its programmes, users in eligible countries can also access over 225 journals from SAGE. NOTE: SAGE collection is open to countries that have not been excluded. Follow @R4LPartnership, @AGORA_R4L on Twitter to stay updated about AGORA.